Spanish moralist and poet; lived at the beginning of the twelfth century. Judah al-Ḥarizi praises him among the renowned poets of the twelfth century; and, judging from the title ("The Great Prince"), which he prefixes to Crispin's name, the latter must have occupied a high official position ("Taḥkemoni," ed. Constantinople, iii. 9b). Crispin was the author of an ethical work entitled "Sefer ha-Musar" (Book of Instruction). This book, mentioned by Al-Ḥarizi, is, according to Steinschneider, identical with the "Mishle Anashim Ḥakamim" (Neubauer," Cat. Bodl. Hebr. MSS." No. 1402, 8), and with "Mishle 'Arab," still extant in two manuscripts in the possession of Baron de Günzburg. Under the latter title it was published in the supplements of "Ha-Lebanon," 1867-68. The "Sefer ha-Musar" in this case would be, if not a mere translation, an adaptation from the Arabic, as stated in the introduction to the "Mishle Anashim Ḥakamim" (see Steinschneider, "Oẓerot Ḥayyim," p. 368). This adaptation was in its turn translated into Arabic by Joseph ibn Ḥasan, under the title "Maḥasin al-Adab," which is still extant in manuscript (Neubauer, "Cat. Bodl. Hebr. MSS." No. 1220, 4). 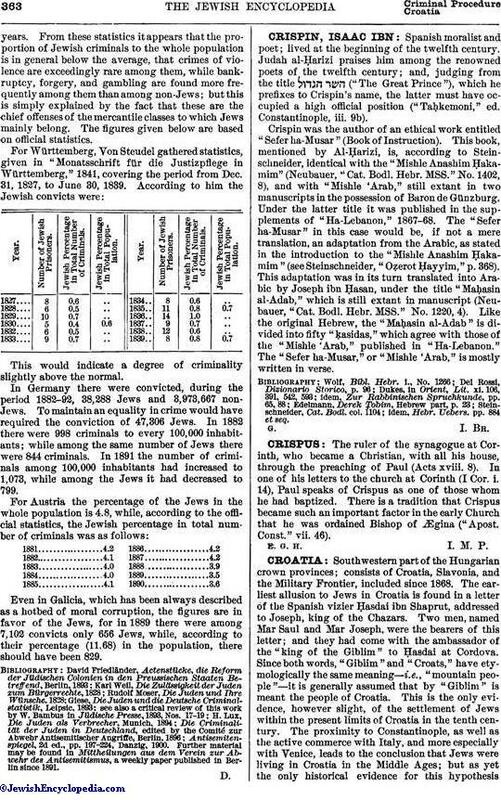 Like the original Hebrew, the "Maḥasin al-Adab" is divided into fifty "ḳasidas," which agree with those of the "Mishle 'Arab," published in "Ha-Lebanon." The "Sefer ha-Musar," or "Mishle 'Arab," is mostly written in verse. idem, Hebr. Uebers. pp. 884 et seq.